Today, after having no opinion on whether or not greenhouse gases work, Anthony Watts has decided to get an opinion. In his opinion the US temperature record maintained by NOAA is pristine. That is, the NOAA Climate Reference Network is pristine. Just how long he'll think it will remain pristine is the question. He wrote an article (archived here) with the headline: "Despite attempts to erase it globally, “the pause” still exists in pristine US surface temperature data"
But, what if there were a dataset of temperature that was so well done, so scientifically accurate, and so completely free of bias that by its design, there would never be any need nor justification for any adjustments to the data? Given that Anthony has been busy for years trying to prove that the record isn't pristine, this is a bit of an about face. Is he admitting defeat? You might think so, mightn't you. Let's come back in five years time, and see if Anthony still says the data is pristine. OMG. Anthony Watts is right. 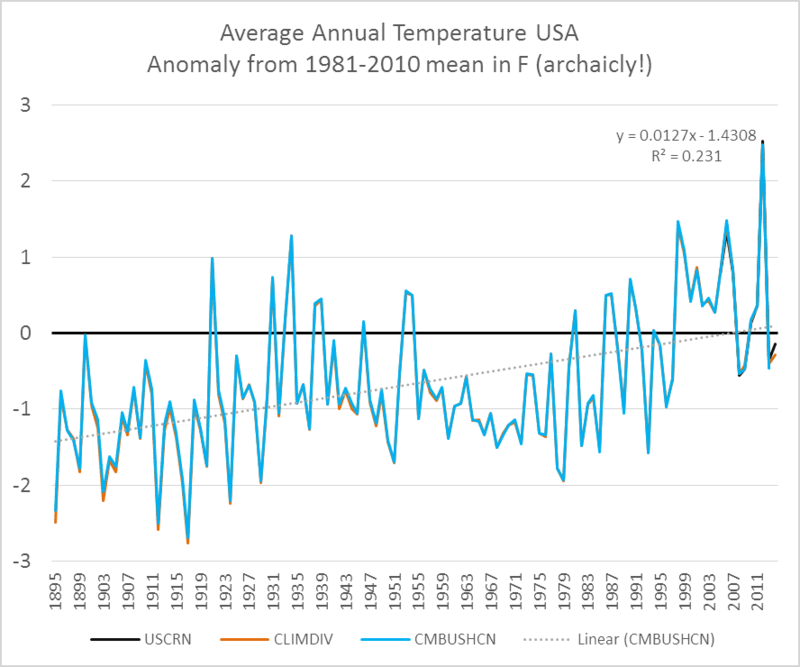 The USA temperature has paused! Ooh, it's worse than that - it's cooling! Let's just see how much the USA has cooled over the past 120 years. If you read WUWT you'll probably think the USA is practically in an ice age. Deniers are in denial. That's not hard to figure out. That's why they are called deniers after all. Have another look at the chart up top. Notice anything? There are two months in the past five years where it wasn't just hot, it was extraordinarily hot. More than 7 degrees Fahrenheit above the 1981-2010 mean. Rather than cooling or pausing, it looks more as if the USA is well and truly out of any cold spell. The zero line is the 1981-2010 mean - and it's barely touched it in the past few years. It's been getting hot in the USA lately, hasn't it. And did he say one word about the amazingly hot year in the USA, in the middle of his pause the average temperature shot up to more than 2F above the average for 1981-2010. I mean we're not talking the twentieth century average - that's above an average that was itself quite a bit hotter. It must be an odd sort of pause, wouldn't you say? Here it is again, in case you missed it. 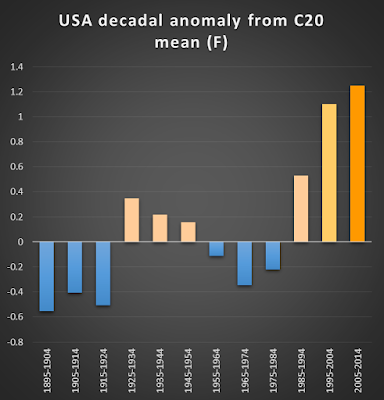 This time charted as an anomaly from the twentieth century mean - 2012 was more than 3F above the twentieth century mean. 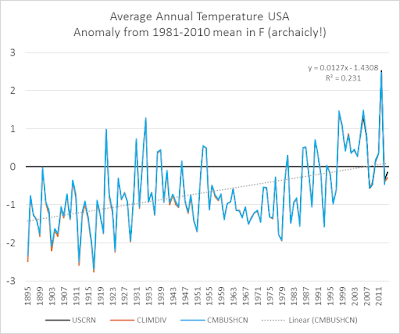 The chart above didn't register with everyone, so here's a decadal chart of US temperatures. 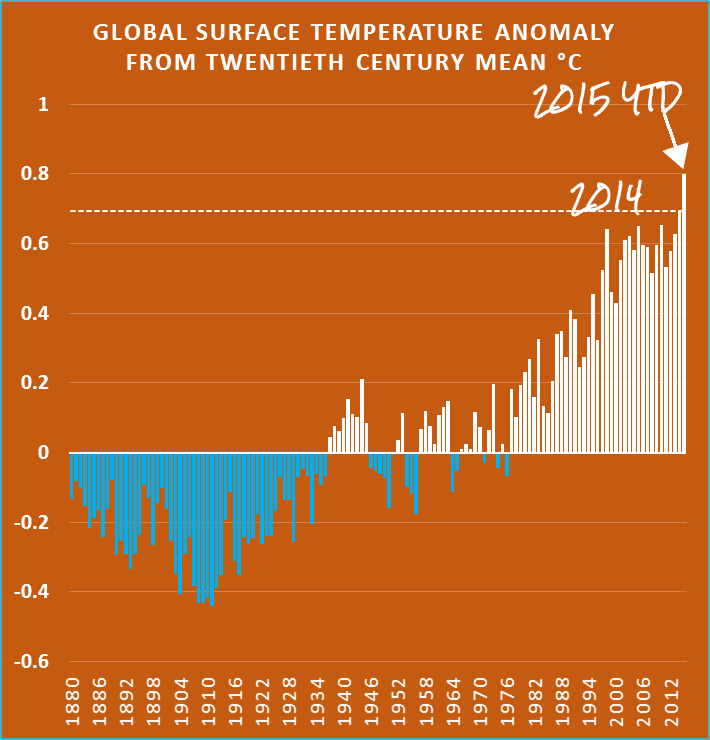 The decade from 2005 to 2014 was the hottest on record. Added by Sou 15 June 5:54 pm. How's that for warming. Almost four degrees Fahrenheit above the twentieth century mean last year. No wonder the Californian drought is so bad. More than 70% of Anthony's home state is in extreme drought and almost 50% in exceptional drought. NOAA helpfully provides that data in a comma separated values (CSV) file, which I have converted into Excel: USCRN-CONUS-time-series. It would be nice if there are as a thorough global independent ground data set. I don’t know if such a thing exists. I have heard of independant sea level assessments but not ground data. Please allow me to mimic a response from the Climate Fearosphere: “Oh, but the US isn’t the world”. You wait, they will accuse you of cherry-picking that 10 years results, Anthony!!!! They can’t (at least not honestly). I plotted the entire dataset available. No choice was made of any kind. As I say, let's come back in a few years and see if he still regards his data set as "pristine". In the meantime, his interpretative skills leave quite a lot to be desired. Archive that data, and make sure there are no changes to past data ! This trend should be publicized far and wide. Yea, the USA is only 4% of the world, but it is suspicious that all the warming (in the adjusted data sets) is alleged to be in far off hard to get to places (like the arctic). Anthony, when are you going to set up a mirror to archive all this data before it gets adjusted? Anthony: Good work here. The fact that this lack of warming exists over a large land continent like the whole USA, presents a severe problem to NOAA in the contradiction of getting a warming result when including the oceans. The physics of that doesn’t make sense. The specific heats of the continent are LOWER than that of the oceans, so if CO2 warming was real, the anomaly must emerge in this data set FIRST. 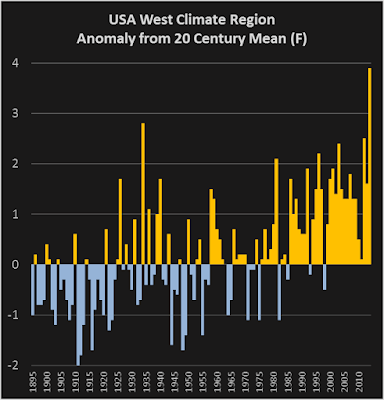 The fact that it doesn’t and the satellite record conforms to the land USA zero trend and slight cooling indicates a flawed and suspect manipulation of the NOAA treatment. If these guys wer doing science, they should have realized this as soon as they obtained the result that they did. Taxpayers have a right to expect that the billions being spent on NOAA per year should be the promotion and reservation of the true ideas of atmospheric science and meteorology, not this asinine power grab that appears to have happened through the Obama administration that is just politicizing every agency it seems to be able to get it’s hands on and further the gross fraud that is CO2 AGW through abusing these agencies and soliciting their agents to help them. Let’s call a spade a spade: Karl set out to achieve exactly the desired outcome he and his pals wanted: to obliterate the pause. To slice and dice measured, observed and established evidence in the way he did to the extent he did represents deliberate climate fraud. Nothing more or less. Simple as that. 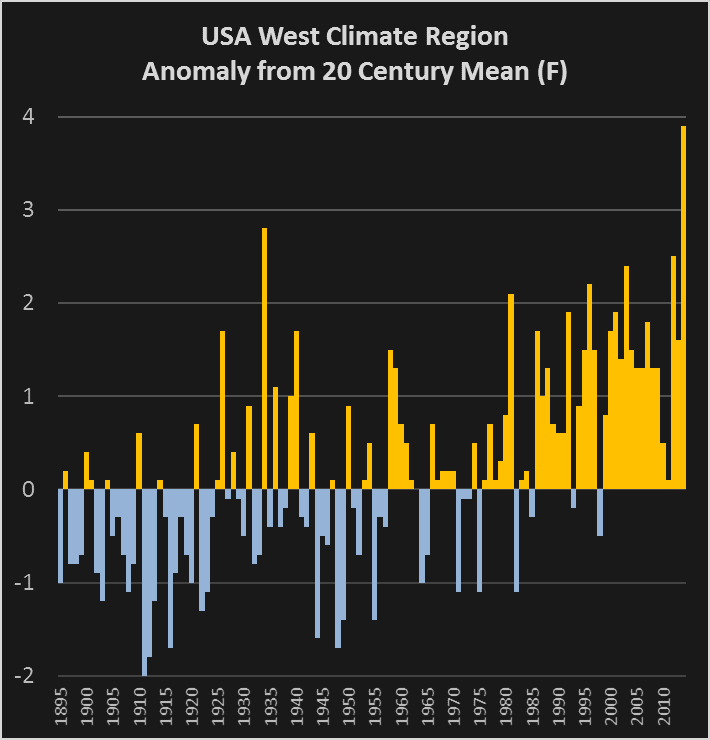 So the new meme is "no warming since 2015, but only in the US"? Those goalposts must get heavy after a bit. I meant since 2005. Stupid fingers. I do not know how you can repeatedly face looking into that cesspool at wuwt and its denizens Sou. This must be the cherry pick of cherry picks but made legitimate by MX Excel? The morons who cheer Anthony from their seats behind their screens must be his only motivation for doing this meaningless analysis. What a coincidence. 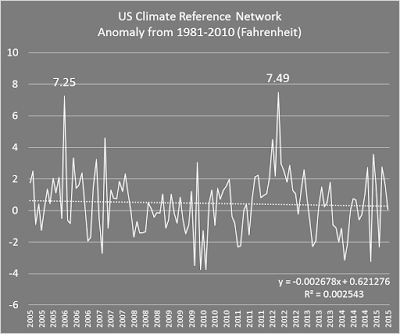 NOAA just published an article comparing the US climate reference network to the COOP network, which is used for the historical US temperature series. That article is somehow not mentioned. One of the authors wrote a guest post about it this week at my place. 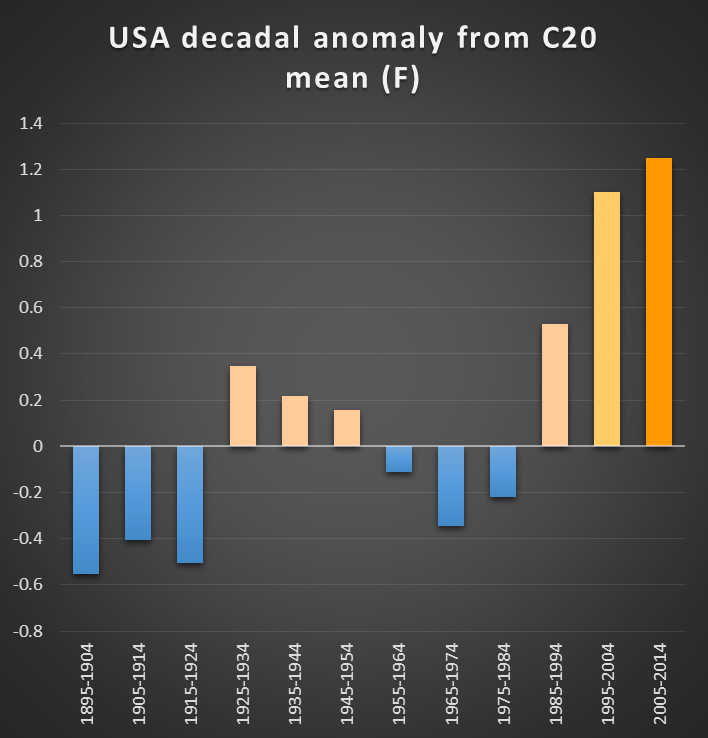 The 10 years is a rather short to interpret trends; the year to year variability for a small region is even higher than for the global temperature. For the comparison that is not much of a problem, both networks measure almost the same weather, the same year to year variability. So personally I would not have emphasised the very inaccurate 10-year trend, but rather the close correspondence between the two networks. That does not leave much room for problems due to urbanization or micro-siting (Watts et al., unpublished 2012) in the historical network. It's pretty amazing how well the homogenization procedures work, isn't it? 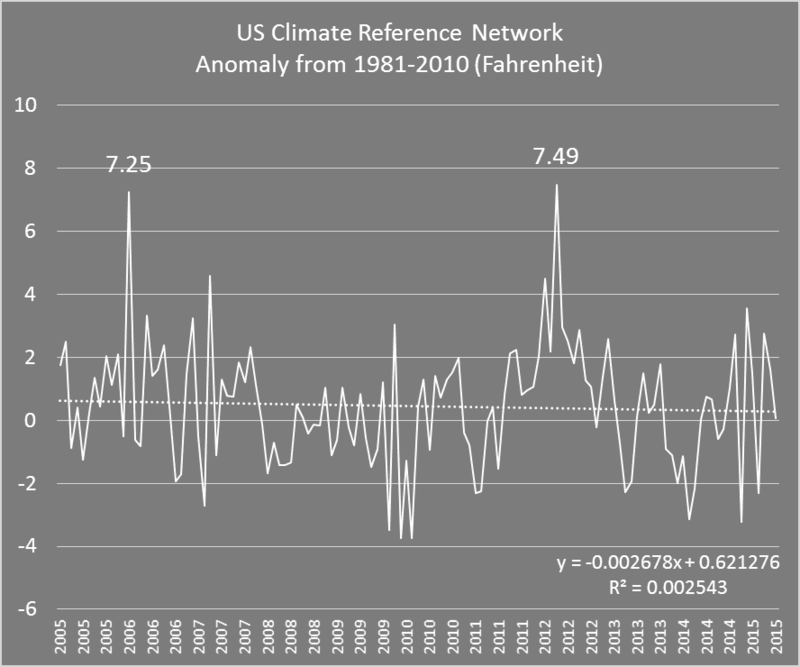 Another thing is that the NOAA seems to have used 1981-2010 as the baseline for all the datasets, including the Climate Reference Network which starts in 2005. Anthony glossed over that bit. It means that it's been aligned along the way with what Anthony would undoubtedly regard as a non-pristine set of data. That is what I thought too - the USCRN uses a baseline from another dataset because the USCRN has not run for 30 years yet. Sou wrote, " It means that it's been aligned along the way with what Anthony would undoubtedly regard as a non-pristine set of data." You have misunderstood the meaning of the word anomaly. The data from NOAA's Climate Reference Network could be "aligned with" the price of tea in China and it would be no less pristine. The average from which the anomaly is calculated does not affect the relative difference between data points or the slope of the curve they make. NOAA's Climate Reference Network is a network of very carefully designed and sited weather stations. I doubt that Watts ever accused the data from those stations of being biased. They were built specifically to avoid localized sources of artificial heating or cooling and they are very carefully calibrated and serviced. Your claim that Watt's doesn't show the long term datasets like GISS is absurd. Those data sets have been posted and discussed many, many times at WUWT. Often to make the point that the keepers of those records have consistently cooled the past, presumably to make the present look hotter than it otherwise would. Correction: point s/be points. Anon got multiple things wrong. Almost everything she (or he) wrote was wrong or a strawman. Confirmation bias maybe? "Often to make the point that the keepers of those records have consistently cooled the past, presumably to make the present look hotter than it otherwise would." Umm, actually no. You are just making an accusation of professional misconduct with no evidence. The reason they "cooled the past" is they put in a correction to remove a warm bias. Thing is, the past was warmed, it wasn't cooled. Scientists corrected the earlier sea surface temperatures with the result being the slope is less steep. Otherwise the warming would have looked greater than it is. I don't think climate science is a scam! But it is a fact that updates of both GISS and NOAA surface temperature records show the past being cooler so that the slope of the warming line is increased. Karl may have warmed the sea surface in the past to make it look like there is no pause in warming but the word "possible" is, rightfully, in the title of that paper. It's also possible the moon is made of green cheese covered by a thin layer of moon dust : ) In any case, there is a long pause evident in the temperature of the lower troposphere as measured from satellites—the most accurate temperature record we have—so it's very unlikely that Karl got it right. I think there is little doubt that the global temperature has stalled and that nearly all the models don't reflect reality since they don't show the pause. Anon, quit contradicting yourself. Either you think climate science is a hoax or you don't. Make up your mind (about your moondust). (BTW HotWhopper isn't WUWT. It's not for posting random and wrong opinions. And your opinions have no influence on facts.). I've already linked to where the corrections to sea surface temperature meant the early records of global temperature are higher, reducing the slope. Nothing to do with any "pause". You are probably getting confused with the time of observation adjustments in the USA, not globally. This necessary adjustment is well covered elsewhere. "the most accurate temperature record we have"
Please explain why you believe the satellite temperature record is the most accurate. It is quite something to claim that a record that is derived from a *proxy* for temperature, and which requires loads of math to extract what may be the temperature in a certain subsection of the earth's atmosphere, is "the most accurate" ! And if t is so accurate, can you explain why Spencer & Christy are already up to version 6 (beta), where all changes in version have changed this supposedly so accurate record? "I think there is little doubt..."
I don't see a problem with Anonymous' claim about choice of climatology not having an impact on trends; it's merely an offset difference. But most else is rather false. Global adjustments to raw data actually warm the past, not cool it, though the story is different in the US where there is a known and large time of observation bias. "Skeptics" have a very peculiar relationship with raw data. They love the idea of raw data (but don't understand how it often hurts their position), but apparently don't have a problem with the satellite records applying large corrections to their own raw data (which, as it were, also hurts their position since the raw data is cooler IIRC). The corrections made by NOAA or NASA or HadCRUT? Fraudulent. The corrections made by UAH? Why it's difficult to even get an independent analysis of those in the first place, but anything and everything that comes out from UAH is simply golden by "skeptic" standards so long as it shows what they want it to, which is lower trends than surface measurements. On that note too, statements like these: "as measured from satellites—the most accurate temperature record we have" are demagogic. We don't have a good idea what all of the problems with the satellite data are, and since we actually don't know what the real temperature is (why indeed would we bother with satellites if we did?) it is very, very difficult to say that one method is "more accurate" than the other. We know for instance that the satellite records are very heavily influenced by ENSO, whereas the surface records are not so much. Is one correct, and the other wrong? In fact, maybe neither! Maybe both are "wrong". Carl Mears actually has an interesting position himself on his RSS dataset (and satellite data in general), commenting how the larger long term difference between RSS/UAH indicates larger "structural uncertainty" than in the surface records, which match each other much more closely. As people paying attention recently will note, since RSS now shows the lower short term trend between it and UAH, RSS is being held up by "skeptics" as the "correct" dataset. Ask the leading researcher though and it seems that's not a shared opinion. For kicks, I produced a 95% confidence interval on the slope of the USCRN dataset, and got -0.145 - 0.080 degrees Fahrenheit per year. This is wide enough that it's hard to say anything about the rate of temperature change, but it's entirely consistent with the long term rate 0.0127 shown in the graph above, and it could be consistent with much greater rates of warming. But... but..... in your graphs I see cooling for the past 10 years. How can this be?? I keep hearing in the news that 2013 was the hottest ever.. then 2014 was the hottest ever.. .and now 2015 is on pace to be the hottest ever yet. Something don't jive... who is lieing to me? You just have the mistaken impression that the US = the world. Resolve that (I know this is difficult for many Americans. I don't even mean that as a joke, on my travels there I was surprised to meet many Americans who don't fathom that the world is a LOT bigger than the US), and you understand what is going on. What Marco said - see here and here. Also, take care with what you think you see. In the USA 2012 was the hottest year on record by a long shot, and the past ten years were the hottest on record in the USA, too. I've now added a decadal US chart above. 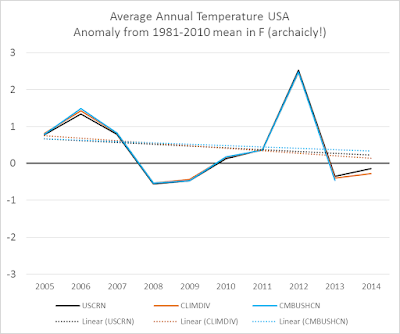 The USCRN does indeed show cooling on average (I am ignoring the error interval). But it is not statistically significant cooling (as was calculated by another commenter) - the "cooling" trend may just be appearing in the data by chance, not as part of any long-term trend. Tamino did the maths a while back. Can we all spare a thought for poor old CET? Watts told her he loved her. She meant the world to him. And now he casts her aside telling her she is 'no longer cool', and he has found another temperature series who understands him. CET was getting too old. Anthony likes them young, 30 or less. 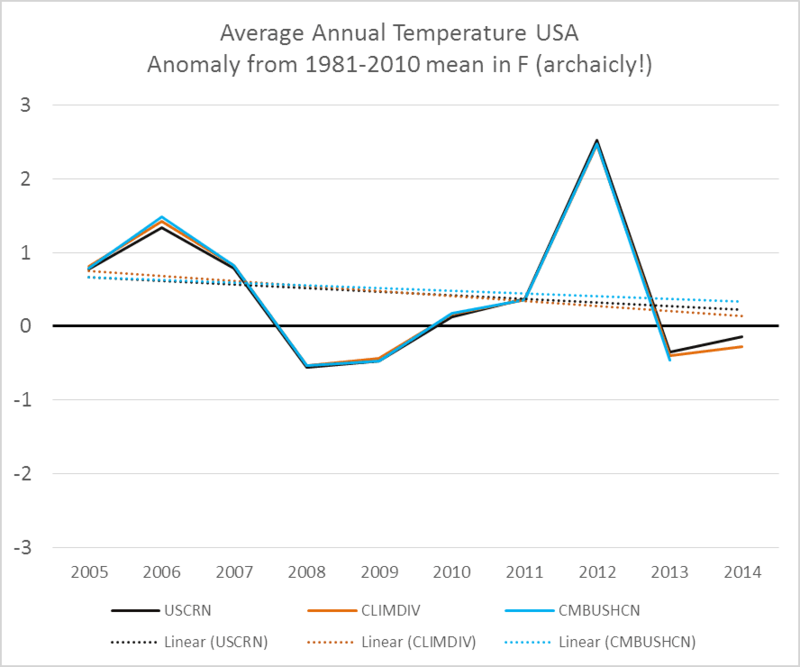 Presumably the poorly-sited stations as identified by the surfacestations project show a bogus warming trend in the US over the same period? I am sure Evan could tell us. Or it will be in the SI for Watts et al 2012/2013/2014/2015. No doubt. Chuck Wiese is one of our local deniers here in Oregon. He does have a bachelors degree in meteorology from Oregon State University and was a weatherman on the local TV stations for a while. I've engaged with him several times over the years. He does have the problem of thinking conditions in the US and even locally in the Pacific Northwest are representative of the whole world. "There are two USCRN stations in Hawaii and deployment of a network of 29 stations in Alaska continues ... ... Deployment of a complete 29-station USCRN network in Alaska began in 2009." Is that right? If so, isn't any 'trend' using raw data going to contain an artefact due to different geographic locations being added? That is why you use anomalies. Then you can average over regions with different mean temperatures without worrying about new stations coming in biasing the mean. Thanks Victor. If I can try your patience a bit more, how are they calculating the anomaly from '1981-2010 mean' at a station that didn't exist until 2009 or later? Ah sorry, that last question is answered in the comments further up.